According to Jewell Peterson, who grew up near Cut Bank, women’s work was essential to homesteading. “A man just couldn’t work out in the fields all day and then come in and start the beans boiling…. 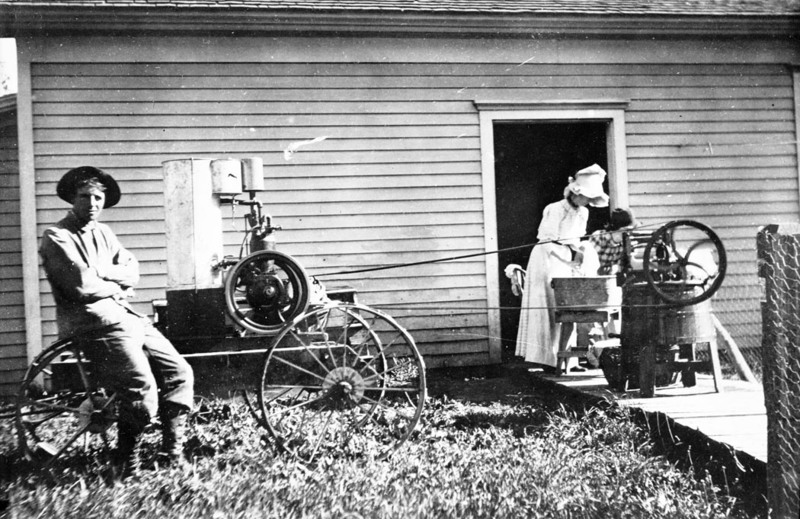 Washing clothes was almost a two day operation.” Homer Goodall built this ingenious washing machine to ease his wife Ruby’s labor. This photo was captured c. 1900 at their ranch near Philbrook, Montana. Photo courtesy MHS Photo Archives 957-764. Husbands perceived that women had more leisure time and so it often fell to them to supplement the family income. “Cream checks” and other financial ventures like selling produce, teaching school, raising chickens and sheep, even mining small claims or taking pictures helped the household survive. Outspoken Janet Smith, the only woman in Montana convicted of sedition, ranched with her husband in the Powder River country. During World War I, she called the Red Cross a fake and bragged that if Americans revolted, she would shoulder a gun and get the president. Both Mrs. Smith and her husband served more than two years at Deer Lodge. The isolation of ranchers like the Smiths made them particularly vulnerable. They did not realize the serious implications of their casual talk. 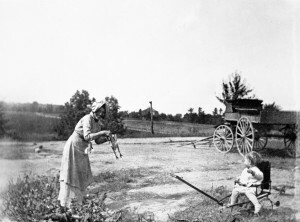 Verna and Ernest Carlson captured this photo of “Aunt Bina Easty” plucking chickens in McCone County circa 1915, with young Adeline Carlson looking on. MHS Photo Archives PAc 82-3.3. 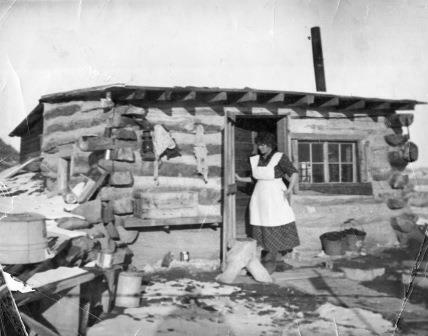 Lilly Smith, affectionately known as “Ma,” was a ranch wife in Garfield County, and a woman who made difficult choices and material sacrifices. In addition to proving up her own homestead in partnership with her husband, Smith was a practical nurse who helped elderly Doctor Lon Keith deliver scores of babies and assisted him in countless cases. She was by his side when he died of pneumonia in 1918. Smith took charge of the doctor’s household, pressed his black suit, and laid out the body. She took a dress length of fine gray silk—a Christmas gift from her son—from her hastily packed suitcase. New dresses did not come often, but Smith had instinctively known that it would make the perfect lining for Doc Keith’s coffin. Ruth Garfield was a ranching wife with a young son whose husband was sheriff of newly created Golden Valley County in 1920. Sheriff Garfield had just been elected to a second term when he was fatally shot. Mrs. Garfield set aside her grief to assist the community and serve out her husband’s term. She was Montana’s first female sheriff and served two years. “Nannie Alderson: Pioneer Ranchwoman” provides a closer look the experiences of one iconic ranch life. Are you interested in Montana women in agriculture? You might enjoy reading Laurie Mercier’s article “Montanans at Work: Business Women in Agricultural Communities” and other articles from Montana The Magazine of Western History. Armitage, Susan. “Western Women: Beginning to Come into Focus,” Montana: The Magazine of Western History, Vol. 32, No. 3, Summer, 1982. Kinsey-Cartwirght, Suzan Kinsey. “Jesse and Ruth Lane,” Montana Law Enforcement Officers Memeorial, Garfield County Page, 1999. Mercier, Laurie K. “Women’s Role in Montana Agriculture,” Montana Heritage: An Anthology of Historical Essays. Robert R. Swartout, Jr. and Harry W. Fritz, eds. Helena: Montana Historical Society, 1992. Work, Clemens P. Darkest Before Dawn: Sedition and Free Speech in the American West. Santa Fe: University of New Mexico, 2006. Schillreff, Fern and Jessie M. Shawver. Garfield County: The Golden Years at Montana Historical Society History Wiki.